The previous article discussed how to start climbing out of a downswing. In this one, we delve a bit deeper. What exactly can you do to turn a loss into a win? Below is a 3-step exercise combining mental game aspects and poker strategy to help kick-start further development in your game. Am I willing to use today as an opportunity to learn and develop myself as a poker player regardless of whether today was a winning session or a losing one? If you answer in the affirmative, you are on track to become a great player. A key to developing yourself as a long-term winner is to use every playing session as a learning lab. In fact, one of your most important tasks is to make friends with your weaknesses and not simply dismiss losses as bad luck, mistakes, or exceptions. While it’s true that sometimes bad luck plays a role when we lose, more often than not there is something in our game — or in our psychology — that needs attention. If we don’t take a long, hard look at losses, we are doomed to keep repeating them. Here is a simple three-step exercise you can implement to kick-start your poker development. Get into the habit of keeping a poker journal in which besides noting results you also routinely record three types of information. First, you need to describe your losing hands thoroughly. Make sure to include all relevant details (effective stack sizes, position, action, etc.). The more details you can include, the better. Next, you want to analyze each hand for areas of improvement and write out what specifically you need to change. Do you see any patterns emerging? Is there a particular kind of error that you tend to make? Ask those questions and note your answers as well. Finally, take the time to write out the specific actions you need to perform in order to make happen those changes in your thoughts, feelings, and behaviors. This might be the most difficult note to record, but making the effort to articulate steps toward improvement can be especially worthwhile. The purpose of this exercise is to bring you face-to-face with your weaknesses. That said, you are not being invited here to wallow in your mistakes. Rather, your focus should be on what you are going to do in an upcoming session to improve your game based on what you learned. Having spent time after your sessions recording this information in your poker journal, get your journal out again before your next session and review what you wrote. Using those notes, then set for yourself an action-oriented playing goal for your next session — something specific you can focus upon when you play. Doing so will greatly reduce the likelihood of your repeating mistakes or bad habits you might have demonstrated before. Finally, right before you sit down to play, take a few minutes to “get in the zone” and think about what you plan to do once those first hands are dealt to you. Start by sitting in a comfortable position and taking a few slow, deep breaths. Once you are centered, imagine yourself as vividly as you can sitting down to play. Then imagine yourself performing the actions that you have set as your daily goal. 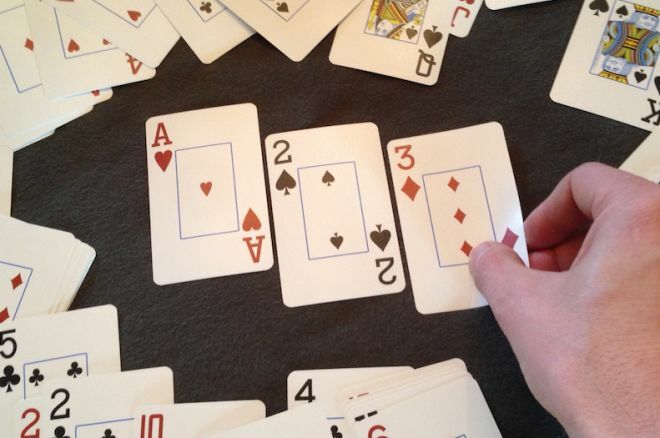 For example, if your goal is to play fewer hands, see yourself waiting patiently for good starting hands. Feel the rush of pride that comes with sticking to your goal. Taking the time to imagine yourself successfully enacting your goals will increase your self-confidence which has been shown to improve performance. While losing is never fun, it can be turned into a useful tool. If you are willing to take the time to review your hands, you will probably find numerous areas in which you can improve. Imagine how much your game, and possibly your attitude, will change if you implement this simple three-step exercise. This article first appeared on PokerNews.com.